Great to see Jenkinson back too. A player who played RB in a victory in Munich for Arsenal (i think) is not a bad player. 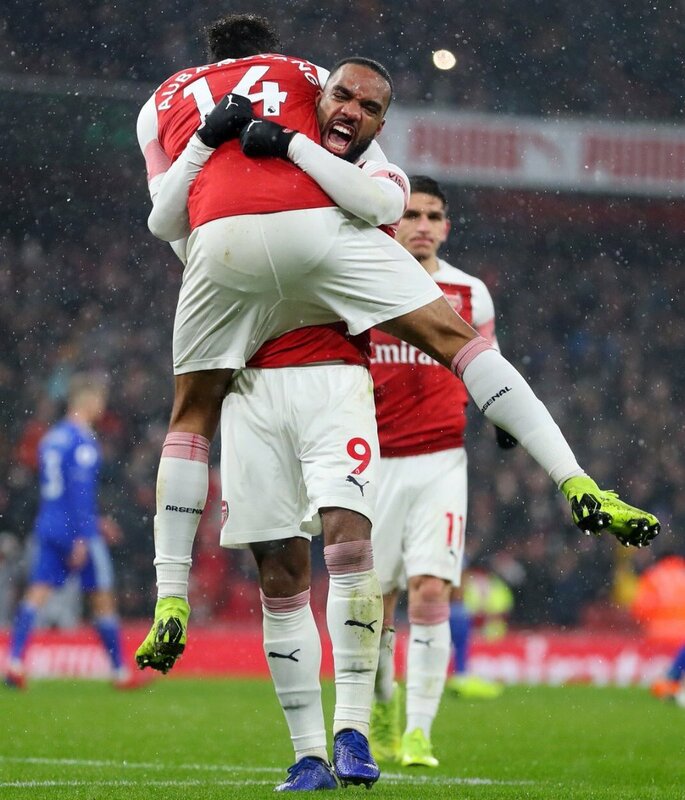 a hard fought win, PEA and Lacca with our goals, not a great performance, midfield was poor in the first half, improved a little when Iwobi came on. Happy to win. A Dean pen! Wow. Like that scene between Travolta and L Jackson in Pulp Fiction : ‘well, we’d have to be talking about one charming muthafucking pig/ one clear muthafucking pen? Amidst disappointment last time out, Laca was very good, prob in best nick since he’s been here and sounds like has carried it on tonight with crucial goal. Concerned and a little depressed if Guendouzi heavily targeted and given little protection: how scummy do all those involved in that have to be? A 19 year old, for the crime of being good with a big personality and lot of bravery on ball? Twats. Wouldn’t care much if it didn’t bring such a big risk of injury if it keeps happening regularly. Couple of late blows with Utd’s reprieve but would’ve gladly taken two dropped points for them at start of night. City….eeeee. They’re gonna bloody win it, aren’t they. The first half, if one team deserved to score maybe it was them. 0-0 was a good result for us in the first half. But the second half we had the opportunity to change this situation. We knew the match wasn’t easy because they worked well and it was not easy to find space. The second half we found better situations to score and win this match. I think firstly respect for the situation. Our thoughts are with Sala, his family, his friends. Cardiff and Nantes. I was in France for two years with him. It’s difficult to prepare in this situation. It was a very emotional match. If a player can come here to help us, he will come. The last news, I don’t know. My focus is on the match. Maybe tonight or tomorrow I will speak. We need wingers. Suarez, who I know, his qualities is this. Will Suarez handle the physical nature of the Premier League? I don’t know now. It’s a challenge for him and also to help us. I don’t know now. We need to know tomorrow in training. I hope some players can be with us. Ainsley, I hope [he can play]. Unsightly but we got the essential. On the targetting of Guendouzi did we not have the same thing happen to Diaby? Great result considering all the emotional attention Cardiff have attracted over Sala. Quite right, really sad that poor lad lost his life. Thought fate might have intervened and Cardiff might have pulled off a win especially with the defence decimated by injuries but we got the points. Looks like Pool to win the league. I’m old enough to recall a time before they won it regularly, when Leeds were in their pomp. They look like they’ll be returning to the top flight Tough game next and I wish we were facing City after a win, last night’s loss will, I fear, inspire a backlash which we’ll feel the brunt of. 36 hours or so of transfer window left and Arsenal are being strongly linked with Denis Suarez, deal looks very close now, Perisic, Nkunku and Carrasco and others, all on loan of course, but as far as I know BPL clubs can only loan in 2 players at any one time, so at the moment it looks like its Suarez and at most one other. Sky Italy reckon we are in talks with Carrasco. I remember Carrasco at Atletico Madrid, and he is still part of Belgium squad despite his move to China, I have always thought of him as a very inconsistent player, inclined to have some great highs, but some lows too, seen him score a few outstanding goals, but he is more of a scorer of outstanding goals, than an outstanding goalscorer, he is 25 so entering his prime. The move to China was an odd one. Marky, I’d only been thinking of Ramsey but you’re right Diaby was also young (about 20?) when he was taken out within 6 months of joining. Wilshere never got much protection either as a youngster (nor after) and quite likely that was behind the first serious ankle problems. I’ve only seen the 30 min Sky highlights and they didn’t show any fouls on Matteo, but I know what to expect from them, and I’ve seen for myself how much teams are going after the player. Carrasco, like Perisic, feels a massive longshot to me. If it took weeks to get that Suarez loan done, it’s hard to imagine condensing that into a couple of days on what should be a more difficult deal, given player’s higher value and bigger role for their club. One thing : was a good article posted on here couple of weeks ago about how the prem’s version of ffp, with its rules on wage increase per year (<7), was the thing jamming us up this window, not a cash problem…but isn't paying loan wages exactly the same as wages if you buy someone permanently? Agent of Nkunku was quoted yesterday as saying pretty bluntly we have a problem/are unable to buy players outright mid-season. So which is it for us? Money for permanent deals or ffp restrictions on wages? That fits with it not just being an ffp wage thing at moment then. Ah, who knows. Supposedly latest gives us a reasonable chance with Carrasco as his club willing to sanction loan with option to buy. I’d be quite pleased with him and Suarez and the prospect of cash boost in summer with new commercial deals coming in. Twitchy about defence though for sure. When I heard Mustafi was injured last night for instance…sheesh. But just have to cross fingers our horrendous luck with injuries to defenders can now change. Wilshere got clogged off the park so I don’t think the nationality is the problem! Mkhitaryan & Welbeck out makes it harder with attacking rotations when you have three games a week. Still the starting line up at home to Cardiff was not as dissapointing as the one at home against Huddersfield. As consistently written here in spite of the unfortunate habit in some quarters to make up what has been written here – such as the projection that only supporters of AW want to see attacking football at AFC! People who hold to this faith would benefit from a little chat with the Inner City Firm down at West Ham after they chased out Big Sam for boring them to sleep and going against their club’s known style of Football, even though they haven’t seen much of it on the Football pitch these past fourty years! Matto may become a top level CM in time. Torreira is already a fan favourite, rough and young he’s also got plenty more to show as he develops. Iwobi has had luck with injuries but I don’t see the dribbling and creativity that Chamberlain produced at the same age in spite of his big injury setback, (Chambo was Southgate’s preferred No.8 last summer). So he’s still got some way to go before he truly replaces Chambo in the squad and that’s where some of these new signings might come in with Welbeck and Miki also out. The two young CMs unlike the veteran RB (Jenkinson has had bad injuries which ended his spell at West Ham but at least he can run!) were encouraging signings, and we can understand the confusion out there over what’s happening beyond the coach at the club at the moment as these are reasonable concerns given that Gazidas dissapered from every photo opportunity he could put himself into as seen during July and it then took six months before his vague replacements deemed us worthy of communication. Not sure how that reflects on AW or what it has to do with him! He always took the responsibility even when it wasn’t his. But there were people who did blame the coaching last season here. For that and other stuff. Probably the very people saying others are moaning now? Couldn’t make it up could you? Ha, PSG massively breached UEFA’s ffp regs once, are supposedly under investigation again after the leaks (I think), have clearly been contemptuous of the rules all along…so of course UEFA are now lining up the PSG chairman for a key role in their executive committee . Do you think that teams who win the league, win it, not necessarily by chasing after the title, but just for the love of playing together? To have that feeling of a unit, to have the feeling of being able to attack and score, to defend by soaking up pressure all day, to control the midfield in both directions? To want to go out every weekend and in mid week, to travel, to play. That if it starts to fall apart they club together and fill in and support. Sounds simple? Seems the hardest thing of all to get a team of 11 then a squad to do that. Its not just focus, its also enjoying being focussed. Sometimes the more we focus on something that seem difficult the more it seems to loom close then disappear, like we try to hard. Im not say teams to think about winning, thats the object of the game, but getting in that place where trust and understanding fit and the whole thing really works. Footballs a strange, very complex thing. For the teams of Klopp and Pep, how long can they hold it together, to keep functioning before bits fall off? Probably just stating the obvious, by the supermarket sweeps of Jan and the summer dont always mean a delicious meal, even if it keeps bellys full and minds in neutral? One thing I could see on the Sky highlights was that Guendouzi was taking on a sort of Matador role with the Cardiff players when deep in our half. I was expecting a replay of some bad challenge on him, probably from Arter, having got that impression from twitter, but it never came, on the highlights. Think a general difference between playing here and elsewhere is that normally an opponent would have their mind on trying to win possession in those situations while in many cases here they are desperate for an opportunity to open up where they can take man and ball and leave as much as possible on man. And if they happen to commit and the ball isn’t there they’ll just carry on anyway. Think that tendency is turned up to maximum against us most of the time, and for some players even more than others. Don’t know why exactly. Playing style is a big factor, but probably as big is if there’s some sort of precedent and the notion takes hold a player can be wound up, or is arrogant, etc. Doesn’t even have to be an accurate notion, and it isn’t, really, with Guendouzi. He mostly keeps his cool with rough treatment, doesn’t go down easier than your average prem player, but it really does worry me has become a big ole target for the opposition, especially for any teams or players who score high in the cynicism stakes, which is many. It does seem that Xhaka in midfield is essential to the flow. Annoying thing with the Ox was that I felt the season he left was going to be the one where, supposing no injuries, we would really find out exactly how good he was as a player. Injuries disrupted progress badly over the years with us, but I also felt he struggled with confidence at times, and seemed to take things to heart a bit more than is healthy. Can’t think of another player who could look so low when things weren’t working out for him in a game. But…that last year, I thought he was getting past that, and while not even playing in a preferred position. So be it. He wanted to leave and he left. Numbers wise, mind, there seems surprisingly little difference with him and Iwobi. Latter’s goal record a bit better and can’t imagine a big difference with assists either (though Iwobi seems to be bit of a specialist in the old pre-assist). Barcelona have confirmed that Denis Suarez has extended his contract and joined Arsenal on loan for the rest of the season. The Suarez deal includes an option to buy. some reports in Germany and France claiming that PSG have tried to sign Mesut Ozil but he has turned it down. Just got in, seems a bit pointless doing a match report now? Martin Atkinson has been nominated as the referee for Sundays visit to Manchester City. Chambo’ assist numbers were affected by where he played, wing back, in central midfield (famously alongside Ramsey during the “1-1” (0-1) at Newcastle, an unglamorous gritty and highly satisfying victory the likes of which the Billy Big Blaggers tell their audience that they never saw till this season (that’s because they write nonsense!). Yep! The most obvious confidence player I’ve ever seen combined with technical issues with his game as he reccovered from that first big injury combined to slow his recovery but he had a significant input into all three fa cup winning runs, and can be proud of what he has to show for his time at the club and his contribution. Fair play to his agent for hoovering up the two best English footballers in their age group albeit Chambo might not quite fulfill that early potential due to his injuries, no doubting his talent though. Unless you are a selfless podcasters who spent years slagging off the player and now find yourself asking for direct dribble attackers/midfielders in the squad! And these people get offended when other football followers laugh at their gibberish heh! I’ve shared stories of how ruthless this agent was with how the youth teams carrying his two clients were managed. Not a fan of that. But I can respect their eye for a footballer. Simple fact is agents have a lot of power and influence in the sport. Am I still allowed to say this on PA or does it violate Faith? And when people see so much money they can act hungry. We can understand. It’s a lot of money. Which is why for many people the values and class of Arsenal Football Club in such context is something that has been important for many of us. Including non-Arsenal fans! I hope no one is offended by the above accurate citation. report that Smith-Rowe is off to RB Leipzig on loan until the end of the season. Auba scored a penalty (his 2nd of the season) against Cardiff (they should have conceded 3 pens in this game) and I wanted to highlight something non-penalty oriented; his astonishing finishing. He’s had 60 non-penalty shots in League play this year and he’s scored 13 goals. 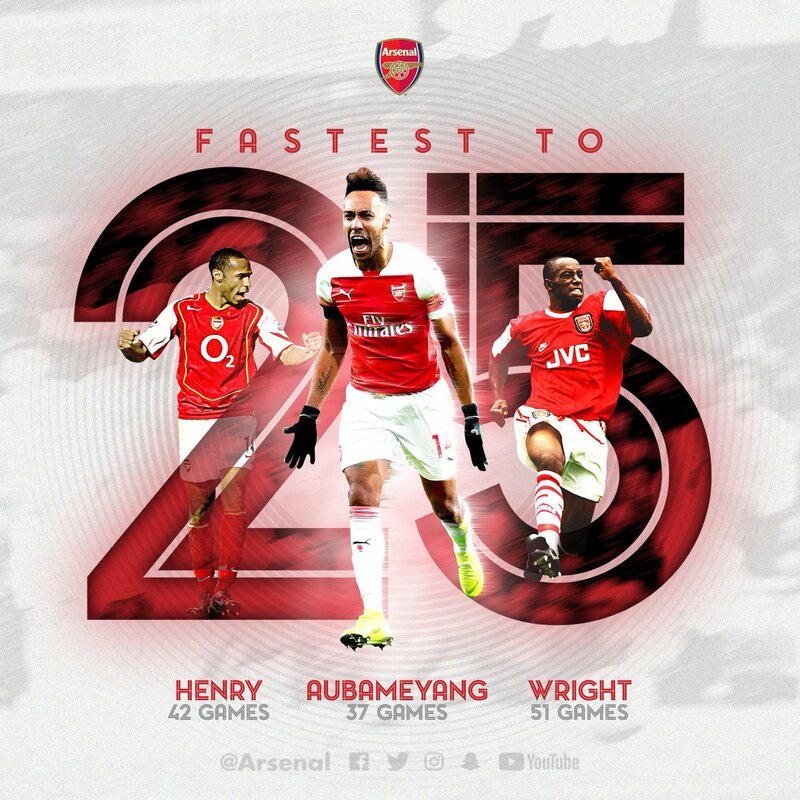 That’s a finishing rate of 22% which is consistent with his finishing over the last three seasons. That’s a phenomenal finishing rate for any player but to give some context, Aguero is 11/72 (15%), Kane is 11/73 (15%), and Salah is 13/71 (18%) this season. Average finishing across all types of players and shots is about 10%. Strikers (good ones) typically start at 15% and go up from there but it’s very rare to see a player achieve 20% finishing over three seasons in three leagues. We are talking non-penalty finishing here and I’m counting goals in Premier League, Bundesliga, Champions League, and Europa League: since 2016/17, Pierre-Emerick Aubameyang has scored 74 goals on 320 shots for a finishing rate of 23%! That number is even more wild when you see that he leads the League this year in missed big chances (17) and that over those same three seasons and same competitions, he’s missed a total of 79 big chances. I’ve been watching Auba for many years and I’ve never seen a player miss as many golden chances as he does. But as long as he’s scoring 23% who cares how many tap ins he misses?